Travel through Kentucky’s hilly woodlands and you may begin to wonder where the national park begins. But you need to look underground to the limestone labyrinth that encompasses Mammoth Cave National Park. With more than 365 miles of a five-layered cave system already mapped, it seems unbelievable that new caves continue to be discovered and explored. 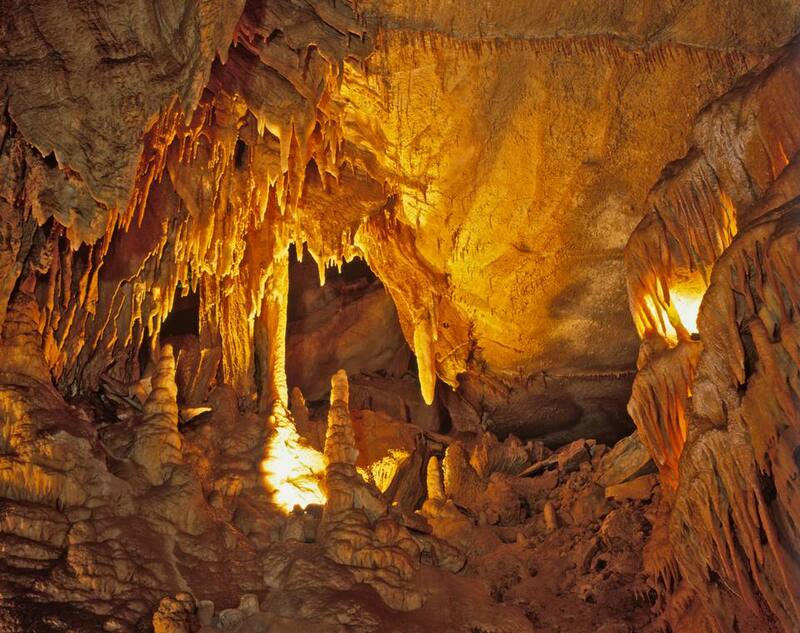 As the world’s longest cave system, this park has much to offer its visitors. Tours are actually hikes inside the earth, showcasing eroding limestone located 200 to 300 feet below the surface. It may seem frightening to some to be surrounded by darkness, sometimes squeezing into tight spots within caves. Yet, cave exploring, or “spelunking,” at Mammoth Cave National Park attracts more than 500,000 men, women, and children annually. It is a truly unique national park showcasing just what our planet is made of. Curiosity led the first humans, Native Americas, into Mammoth Cave about 4,000 years ago. Remnants of ancient torches, clothing, and sandals have been found, giving clues to the past. Europeans came to the cave in the late 1790s, and guides have been leading tourists through it ever since. Mammoth Cave was established as a national park on July 1, 1941. It was recognized by the United Nations Educational Scientific and Cultural Organization (UNESCO) as a World Heritage Site on October 27, 1981, and was designated as an International Biosphere Reserve on September 26, 1990. Considering most attractions are underground, visitors can plan a trip during any month. Summers tend to bring the most crowds and, therefore, have the most tours to choose from. The most convenient airports are located in Nashville, TN and Louisville, KY. And Mammoth Cave is nearly equidistant between the two cities. If you are traveling from the south, take the exit at Park City and travel northwest on Ky. 255. From the north, take the exit at Cave City and head northwest on Ky. 70 to the park. There is no entrance fee for Mammoth Cave National Park. However, fees are required for certain tours and for camping. Tours will generally cost about $15 per person, and camping is about $20 per site. Prices for specific tours and campgrounds can be found on the official Mammoth Cave fees and reservations website. There are plenty of tours to choose from and reservations are required in advance. Check out what tours work with your time constraints and keep in mind what you can physically handle. Two tours are highlighted here for you and showcase some of the well-known things to see. You will begin this tour actually walking into the Historic Entrance which was originally discovered by pioneers in the 1790s and by Indians thousands of years before. Travel along Broadway, an underground avenue that leads to a spot called Methodist Church, where services may have been conducted in the 1800s. Farther on, you will come to Booth’s Amphitheater, which recalls the visit of actor Edwin Booth. Check out the Bottomless Pit, which drops 105 feet deep. On your way back to the entrance, you will go through Fat Man’s Misery, a passageway that has been smoothed and polished by generations of spelunkers. Past that, you will come into Great Relief Hall, which is a large chamber that you can actually stand up in. Continue on to see Mammoth Dome, which stretches 192 feet from floor to ceiling and was carved by water dripping through a sinkhole. Finally, check out the Ruins of Karnak—a cluster of limestone pillars. This tour is very crowded during the summer and lasts 4.5 hours. It begins with a bus ride to the Carmichael Entrance, a concrete bunker/stairway that takes visitors down to Cleaveland Avenue—a long chamber tunneled out by a river. Walls sparkle with gypsum, seemingly unbelievable as it takes a thousand years for one cubic inch of it to form. About a mile ahead is Snowball Room, where the tour will stop for lunch. Another river canyon, Boone Avenue, takes visitors 300 feet below into passageways that are sometimes so narrow you can touch both walls at once. The tour ends at Frozen Niagara, a giant cascade of flowstone, including shimmering stalactites and stalagmites. For more tour options, check out the official Mammoth Cave tours website. There are three campgrounds located within the park, all with a 14-day limit. The headquarters is open March through November and includes tent and RV sites. Maple Spring Group Campgrounds is also open March through November and only offer tent sites. Houchins Ferry is open year-round on a first come, first served basis. Also located inside the park is Mammoth Cave Hotel which offers 92 units and cottages.